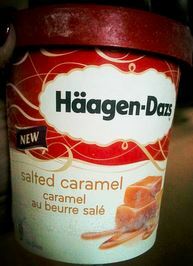 There are few things in this life as good as salted caramel. It is sweet yet not too sweet as the salt both enhances the flavour and calms the sweetness. I’ve reviewed a lot of salted caramel bits including Paul A Young Chocolates and Lucky’s London salted caramel brownie bites enrobed in chocolate. Ice cream’s time has come and not a moment to soon. This luscious delight from Haagen Dazs caused my diabetic husband to actually learn moderation and enjoy a few bits of it. He actually ended up eating more than me but hey – I’ll forgive him once the divorce is final (KIDDING!). The ice cream itself is absolutely delicious. The inclusions end up as random pockets of salted caramel swirling ribbons of deliciousness with occasional balls of chewy salted caramel dreaminess. The caramel ice cream isn’t too sweet and doesn’t have that strange aftertaste some caramel ice creams do from other brands. This salted caramel ice cream is the perfect balance between flavour and sweet, with that salty edge cutting through what would otherwise be extreme sweetness to create a delightfully singular flavour. This ice cream is supposed to be available in Waitrose but it is always sold out when husband or I go shopping and unsurprisingly. 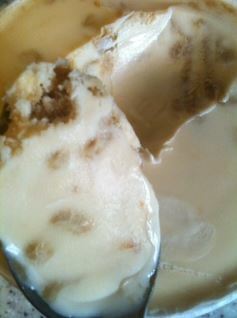 As more and more people try this ice cream, more and more will become hooked. This is just brilliant.